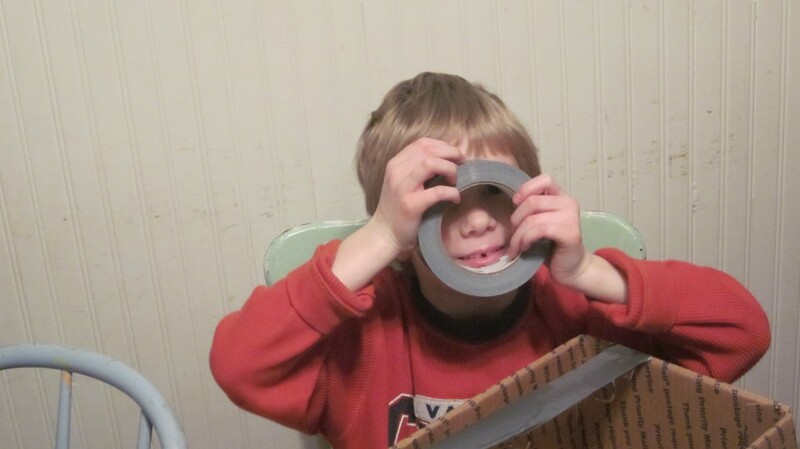 Oh, my boy, please put down the duct tape . . . life is not THAT bad now, is it? Little Mack has been in a funk. I can only guess why: he has some loose teeth that are bothering him; he’s an outdoorsy soul (like his mama) and the winter is getting a little long in the tooth; we’ve been very busy here with melodrama preparations and he’s getting pushed aside in the shuffle; I don’t know. Perhaps a combination of all of these? I think it’s time for a bit of pampering of my little man, and so I think I’ll ask him to make something wonderful with me today: hot Butter-Dips! We’ll put our aprons on and put on some happy music and grab our rolling pins and just enjoy ourselves making these Dips, and then we’ll eat them, of course–straight out of the oven, dipped in honey! They are crunchy on the bottom and tender inside, and simply scrumptious. I’ve been making these delicious biscuit-like delicacies for years, and they never fail to put a smile on the faces of everybody in the house. They’re very easy to make and go great with soup or stew. Maybe you have time to make some today? If not—make the time! Make the time! I guarantee it: they’ll make your family smile! I’m smiling just looking at this picture. Yummm. 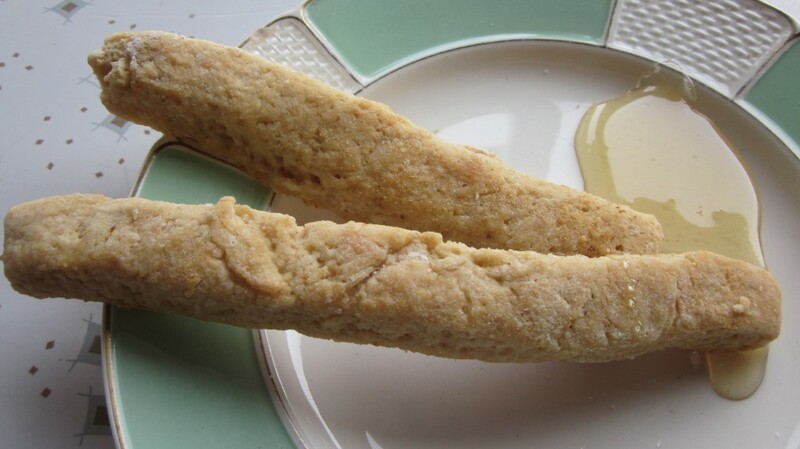 Imagine these butter-dips hot and steamy and dipped in honey! My kiddos actually call them “honey-dips” because that’s how we always eat them! Soft biscuit-type dough is rolled out, cut into strips, and dipped in melted butter and then baked. Don't worry--the fat and calorie content is lower than that of traditional biscuits! Melt half of the butter in each of two jelly-roll pans while oven preheats to 400. Don't let it burn! Remove pans. Mix dry ingredients; add milk, and then stir until a soft dough forms. Turn dough out onto a well-floured countertop and roll to coat with flour. Gently knead a few times. (Dough will be quite soft.) Roll out ¼ thick. Cut into 1 inch by 4 inch strips. Dip each strip in melted butter, coating both sides. Arrange strips closely on baking sheet, sprinkle with sesame seeds or whatever, and bake at 425 for 10 to 14 minutes or until golden brown. Have honey ready for dipping! Can you think of somebody who might enjoy this recipe? Then, please do me (and them!) a favor and share this post and *hugs* Thank you! ← Eventually, Mothers Grow Up Too . . . Ideally . . .
Will little Mack mind if I steal one or two? No, Caro, he might even share his puddle of honey with you, to dip it in! Those look good, and the recipe looks like I could modify it to be gluten-free! Liz, I think you could do that. I just posted a picture, so if you want to take a look, it’s up! I think you’re right, Liz. Good luck and let me know how they turn out, if you try that! You wouldn’t happen to have a photo of what these biscuits should look like when they come out of the oven, do you? It sounds as if these would go good with Chili. Do they? 🙂 If so, my partner would love a taste! Bonnie, I posted this earlier without the picture, but I just added the picture, so if you want to go back and take a look, it’s up! Sorry about the glitch! They do go well with chili or any kind of hearty soup. And they’re just terrific dipped in honey! lol, Boys will be boys. We will try this recipe soon. Debbie, it IS yummy, and better yet–very quick and easy to make! Enjoy! My wife will love these, any excuse to enjoy more honey. I just got 6 new bottles which should last her a few weeks. I’ll surprise her with some of these tomorrow before she leaves for work. You can throw in a quarter-cup of bran or wheat germ to make the texture more interesting if you like. Hope your wife enjoys them! Wow, these sound awesome. I can practically smell them in the oven, giving off a buttery, baked aroma. Yum! They really are buttery and delicious! You should try to make a batch, Donovan! I make these too! They are also great with Spaghetti (add garlic to the butter &/or dough). I think I’ll make some tomorrow for my cold-infested Farmer. Thanks for the idea. Oooh, Kay, garlic butter dips! Yum! Sorry your Farmer has a cold! At least maybe he can stay inside today? These look great, but I am confused about the recipe. You melted butter on two jelly roll pans, is this where you dipped them into the butter, or where you baked them? Or did you dip them into butter elsewhere, or bake them on a seperate sheet that did not have melted butter? I am missing a step somewhere. I am sorry for the confusion, Jerri. I will have to dig in and correct that in the recipe. I melt the butter on the jellyroll pans, then I remove the pans from the oven and dip the strips of dough in the butter, and then place them in the same pans (there will still be butter in the bottom of it) and bake them. Great question! Thanks!